SHOW IS CONTINUING AS SCHEDULED. WE ARE ON GENERATOR POWER. “I believe every sound you listen to informs your ears, and therefore your musical perspective. We grew up hearing the sounds of nature, rather than the sounds of cities,” says Bee Eaters co-founder Tristan Clarridge. Perhaps it was their free lifestyle growing up in a tipi on the side of a mountain in a remote part of Northern California that influenced their musically explorative sound. Or the fact that Tristan and fellow co-founder and sister, Tashina, never went to a day of traditional school but began music lessons at age two, sometimes driving thousands of miles for music camps and lessons and spending much of their time exploring and learning on three week backpacking trips. Venerable string masters Mike Marshall and Bruce Molsky lend their talents to this latest release, with Marshall playing mandolin and Molsky adding his voice to the group’s arrangement of Bruce Hornsby’s “The Way It Is”. Revered Nashville sound engineer Dave Sinko captured the music with a delicate touch, bringing a pure and organic honesty to the Bee Eaters sound that matches their musical approach. The eleven-song set of group collaboration takes a focused view of those things in life that resonate with you through the years but perhaps don’t come into focus right away. The joys of traveling and contemplative nature of a visit to Alaska come out beautifully in “Petersburg Interlude” with a recollection of time spent on a fishing boat in the harbor, looking out through the fog and rain towards the mountains across the water. Or the rhythms and twisting melodies of “Gyrosmoke,” a tune written by one of their musical mentors, fellow stringband pioneer and fiddle guru, Darol Anger. The tune that is the namesake for the album, Oddfellows Road, as the band says, “incubated for years, unnamed and unyielding to our efforts to arrange and play it.” It was eventually named after the street that band principle Simon Chrisman grew up on, at the south end of Bainbridge Island. Brother-sister duo Tristan and Tashina Clarridge, long known and lauded by those steeped in the American fiddle tradition, are joined by hammer dulcimer wizard Simon Chrisman. Together, they weave a tapestry of sound all their own, drawing on roots in bluegrass, Celtic, jazz and old-time traditions. While today’s new breed often produces an amalgamation of sounds and styles based on a distant view, The Bee Eaters were raised embedded in these traditions… raised to mold, meld, shape them and carry them forward, leaving their own indelible marks in the process. With Tashina’s delicate fiddle and Tristan’s grounding cello wrapped around Simon’s ethereal dulcimer, they have created a never-before-heard sound in American music. No tricks. No pyrotechnics. Three instrumental voices, united in their musical exploration. Grand National Fiddle Champion Tashina Clarridge has toured with Mark O’Connor, Tony Trischka and Laurie Lewis and has performed at Carnegie Hall as a part of MacArthur Fellow/Grammy-winning bassist Edgar Meyer’s Young Artists program. 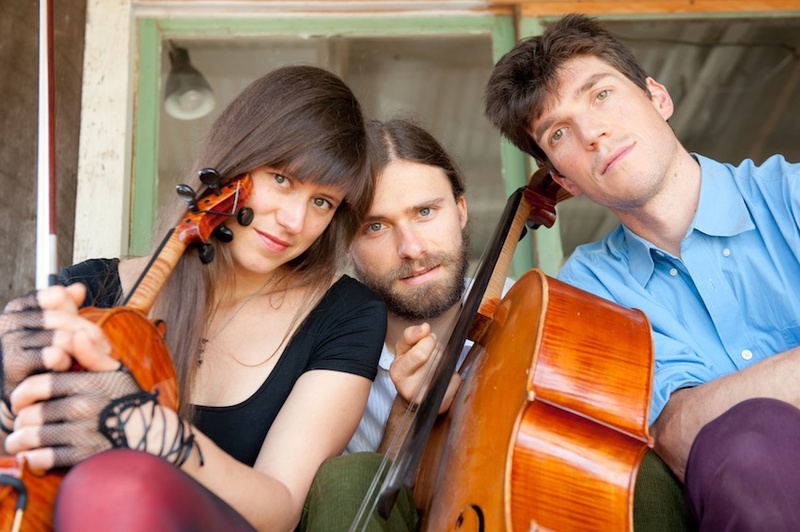 Multi-instrumentalist brother Tristan is a 5-time Grand National Fiddle Champion and a pioneering cellist, synthesizing traditional folk influences with rhythmic vocabulary from jazz, rock and pop music, and leading a revolution among adventurous young cellists throughout the country. He has toured the world with bluegrass/nu-folk sensation Crooked Still and Darol Anger’s Republic of Strings, as well as Mike Marshall, Bruce Molsky and Cape Breton fiddle phenomenon Natalie MacMaster. Hammer dulcimer virtuoso Simon Chrismanbrings a whole new approach to an instrument that has previously been thought to have limited range and technique. His inventive virtuosic touch and sophisticated rhythmic sensibilities are redefining the instrument and earning the attention of musicians from all over the world. Since their formation in 2008, The Bee Eaters have been on a trajectory of growth, both personal and musical. Recent tours have taken them from Vermont to Hawaii to England and everywhere in between, collaborating with performers such as bluegrass legend Laurie Lewis, Appalachian music master Bruce Molsky, rising-star songstress Aoife O’Donovan (of Crooked Still renown), soulful singer/guitarist Scott Law and writer/ballad singer Jefferson Hamer. Festival highlights include Wintergrass, and the 40th annual Indiana Fiddlers Gathering. The Bee Eaters have collectively taught hundreds of lessons and workshops in communities, schools, and colleges such as the Berklee College of Music, the University of Victoria, Humboldt State University, and many others. Tashina and Tristan co-founded the Mt Shasta Music Summit, now in it’s 9th year, which unites the highest level of musical masterminds with musicians of all ages and skill levels, for a series of workshops and all-star concerts exploring the connections between musical traditions of the world, in a holistic community environment. The Mt Shasta Music Summit is revered by many as a powerful musical and social melting pot; young students and professional musicians come together to share, driven by a bold vision of strengthening the interwoven connectedness of music, community, and culture.